5.0 颗星，最多 5 颗星Best Guide to Comprehensive Health as Vegan. Ever. I've read virtually every book on vegan/plant-based health and this one is one of my favorites! As the title implies, it is incredibly comprehensive. It covers every single nutrient you'll be incessantly pestered about as a vegan... Where do you get your protein? Omega 3's? B12? Iron? Zinc? Selenium?.... On and on and on... Instead of trying to dig through the sincerely questionable advice being regurgitated across the blog-o-sphere, it's so much easier to have a well-written, well-researched guide available at any time. Get this book, learn how to feed yourself, and rock on as a super healthy, long-term, successful, and knowledgable vegan! After reading Becoming Raw, I felt that my diet was sub-par, to say the least. I had started a raw diet several months previous to reading Becoming Raw, following the advice of several "experts," much of which turned out to be dangerous to my health. I decided a completely raw diet was not healthful for me, and returned to veganism with cooked foods and ordered this book for guidance because I so trusted the authors. Becoming Vegan is the most thorough (and easy-to-read) book on veganism that I have found, and has a ton of research for further study. The authors are both registered dieticians and completely honest about the often-missed and neglected areas of veganism. They offer easy and doable suggestions on correcting imbalances in the diet. After taking the information in this edition to heart and putting it into practice, my follow-up lab tests have confirmed that many of the imbalances and problems I had previously, before reading Becoming Raw and Becoming Vegan, have been corrected. Those that have not been corrected completely are showing improvement with time. I highly recommend Becoming Vegan, for anyone considering or already following a vegan lifestyle. For anyone who needs to be a total herbivore, this is an excellent source and resource for the nutrition aspects of veganism. It deserves a 5-star rank. That said, there are a few things a buyer should know. Don’t let the first chapter put you off. That’s the one about the philosophical/environmental/Progressive/animal rights need for Vegans. The authors get that over with early and don’t bring it up again. If that’s all you care about, you will be disappointed. However if you are facing life-threatening illness and need to know the nutritional aspects of your food, this book is for you. There is quite a bit of repetition, much of it unnecessary. The trouble there is the resultant huge size of the Index, which makes it hard to look up subjects. There’s just too much. Sometimes I could not tell which letter of the alphabet was showing. That should be corrected with dictionary guides in the upper corners of the pages. Some items are clearly unnecessary. I would argue that the niacin content of durians is irrelevant. Most people who can read this book (i.e. English speaking) would not venture anywhere near a durian. I purchased this book because it was recommended by Michael Greger, M.D. (“How Not to Die”). If you have to go herbivore and need a good nutritional reference, this is it. A comprehensive resource for people interested in improving their diet, even if you don't decide to become vegan. 5.0 颗星，最多 5 颗星The most comprehensive book on eating properly I have ever read. This book was a great read. I actually started with the Kindle version and ended up also getting the paper version because I wanted to continually refer back to various parts of it for nutritional information. 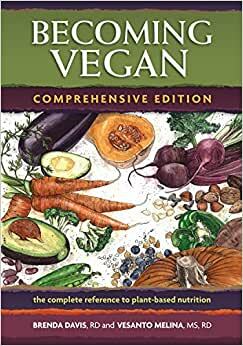 I have been vegan over a year now and found this book a comprehensive addition to my nutrition library that anyone trying to be vegan at any level could use. It is written in ways that a non-nutritionist can deal with but is also very thorough. If you are considering going vegan, whole food plant based for health reasons alone, which is what I did, then you might find the first chapter on animal issues a bit too much and you could skip it and not miss anything relative to diet. However, if you are driven by animal issues as well as health issues then don't skip the first chapter. Beyond the first chapter the authors cover every single aspect you could possibly be interested in relative to going vegan in a healthy way.